The N2Women workshop aims to foster connections among the under-represented women in computer networking and related research fields. The 6th N2Women Workshop also welcomes men who share the same research interests, attend the same conferences, and often face the same career hurdles and obstacles to join us! Connect newer generations of networking women researchers with the community and create mentorship relationships. Create a research forum in which students and junior researchers learn and discuss current trends in networking, present their research and receive feedback. Engage a diverse body of junior researchers in the field. Registration to the workshop is FREE. The registration is through the [SIGCOMM conference registration]. Abstract: While the Internet is a hugely successful, human made artifact that has changed the society fundamentally, it has become a complex system with many challenges. In this talk I will outline some of them and also point out a number of surprises in terms of our mental models of the Internet that we develop over the years. Next, I will focus on the evolution of the Internet and discuss methods for detecting Internet infrastructure outages, how to extend software-defined networking concepts to wireless networking, how to achieve predictable performance in distributed systems. I will end with an outlook on how we may evolve the Internet to tackle the future challenges of ubiquitous data availability from sensors and devices everywhere. Bio: Anja Feldmann is a full professor at the TU Berlin, Germany, since 2006. Her research interests include Internet measurement, traffic engineering and traffic characterization, network performance debugging, intrusion detection, network architecture. She has published more than 60 papers and has served on more than 50 program committees, including as Co-Chair of ACM SIGCOMM 2003 and ACM IMC 2011 and as Co-PC-Chair of ACM SIGCOMM, ACM IMC, and ACM HotNets. From 2009 to 2013 she was Dean of the Computer Science and Electrical Engineering department of TU Berlin, Germany. From 2000 to 2006 she headed the network architectures group first at Saarland University and then at TU München. Before that she was a member of AT&T Labs - Research in Florham Park, NJ. She received a M.S. degree from the University of Paderborn, and M.S. and Ph.D. degrees from Carnegie Mellon University. She is a member of the German Academy of Sciences Leopoldina, the BBAW, the supervisory board of SAP SE. She is a recipient of the Gottfried Wilhelm Leibniz Preis 2011 and the Berliner Wissenschaftspreis 2011. Moderator: Theophilus Benson, Duke University; Panelists: Lixia Zhang, UCLA; James Mickens, Harvard; Te-Yuan Huang, Netflix; George Porter, UCSD. Abstract: Being female in a male-dominated profession is oftentimes perceived as a disadvantage. Special challenges we face can include work-life balance, relations with other colleagues, perceived discrimination, alienation, and exclusion, etc. At the same time, we know that diversity is critical to ensure a robust community and we have seen continuous effort being made to increase diversity and inclusion at different levels. In this talk, I will share my 14 years of career experience as a female science professor. I will discuss my views on how being a minority can be an advantage in your career development, and ways to make it happen (i.e., a recipe of turning the lemons into lemonade). In addition, in my role as a NSF program director, this talk will also offer a broad view of wireless networking and security research and funding opportunities from the perspective of NSF investment in these areas. Bio: Wenjing Lou is a Fellow of the IEEE and a Professor of Computer Science at Virginia Tech. Her research interests include wireless networks and cyber security. Since August 2014, Prof. Lou has been serving as a program director at the US National Science Foundation (NSF). 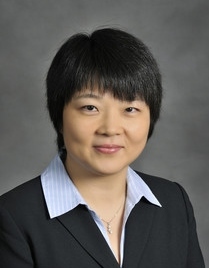 At NSF, her responsibilities include the Networking Technology and Systems (NeTS) program, a core program of the Computer and Network Systems (CNS) division within the Directorate for Computer & Information Science & Engineering (CISE), and the Secure and Trustworthy Cyberspace (SaTC) program, a cross-cutting security program led by CISE/CNS. The N2Women workshop will be held in the Boelter Hall Building. Entrance to the building is on from the Court of Sciences, on the fifth floor of the building. The workshop will be held at BH 3400, two floors below the entrance. The map below shows the recommended way between Luskin Center and the entrance to Boelter Hall. Accessibility: Note that this way requires climbing some stairs. That long arrow between Ackerman Union and Engineering VI is primarily up flights of stairs. One can avoid the stairs by going into Ackerman Union and taking an elevator up two floors. You can then walk out to the area between Ackerman and Kerckhoff and get back on that long red arrow. N2Women will have a mentor/mentee program. We would like to extend mentoring throughout the week for the students who are staying for SIGCOMM. In this case, we are hoping to find mentors who can host mentees with similar research interests during the main SIGCOMM conference and workshops. If you are a SIGCOMM regular attendee and a senior researcher, please consider volunteering as a mentor. If you are interested in helping out, please email one of the mentoring session organizer. Posters are solicited for research related to any aspect of networking and communications. All researchers in the networking and communications fields are welcome to submit their work for presentation at this workshop. Posters will not be published and can therefore be under submission to other conferences or workshops. Authors of accepted posters will be invited to present their work as part of a lightning presentations session. One poster will be selected to receive a Best Poster Award. Presenting a poster is a great opportunity, especially for students, to obtain interesting and valuable feedback on ongoing research from mentors and a knowledgeable crowd at the workshop. Participants who are submitting posters are highly encouraged to examine if they are eligible for workshop travel grants. Each submission should be formatted as an extended abstract, describing the research to be presented in the poster. The length of the extended abstract should be at most TWO pages (formatted into the US letter size of 8.5 x 11 inches with fonts no smaller than 10-point size), including all figures and references. The extended abstract must include the names, affiliations and email addresses of all authors and should be submitted as a single PDF file at https://n2women17.hotcrp.com/. N2Women is pleased to provide travel grants to its annual workshop, co-located with SIGCOMM’17. N2Women aims to foster connections among the under-represented women in computer networking and related research fields. The 6th N2Women Workshop also welcomes men who share the same research interests, attend the same conferences, and often face the same career hurdles and obstacles to join us! The travel grants will be given to applicants who participate in the N2women workshop. Applicants can be at any stage of their career, both in academia and industry. Priority for the travel grants will be given to applicants who are women, under-represented groups in their country of residence, and people with disabilities. N2Women runs a joint travel-grant applications process with SIGCOMM’17. Applicants for the travel award should apply using the following link: https://sigcomm17travelgrants.hotcrp.com/. For those applications that do not use the SIGCOMM travel grant format, the N2women travel grant applications should include the curriculum vita of the applicants, and a short personal statement (maximum one page). The personal statement should include an overview of the research interests/accomplishments and a description of how attending the N2Women Workshop will be beneficial. The applicant must also state if he/she has submitted a N2Women’17 workshop poster and/or has accepted SIGCOMM 2017 paper, poster, or demo. Student applicants (i.e., Bachelors, Masters, and PhDs) should have their advisor send to n2women17-travel-grant-committee@googlegroups.com a supporting letter including the details specified: (1) Confirmation that the student is a Bachelor, a Master, or a Ph.D. candidate in good standing within his/her graduate program; (2) Ways in which attending the workshop and main conference would benefit the particular student. The N2Women Travel Grants Committee will review applications, and the grants will be announced by June 23, 2017. Travel grant awards are meant to partially cover the cost of attending and participating in N2Women 2017. Note that the award recipients will need to pay for the expenses ahead of time and get reimbursed after the after the N2Women workshop and under receipts reception. The exact number of awards will depend on the availability of funds and will be determined as funding amounts are finalized. This workshop is possible thanks to the generous support of SIGCOMM, IEEE COMSOC, NSF, Facebook and Google.